This is the outfit I wore to work today, it is probably one of my favourite all time looks because it features some of my most loved pieces from over the years. 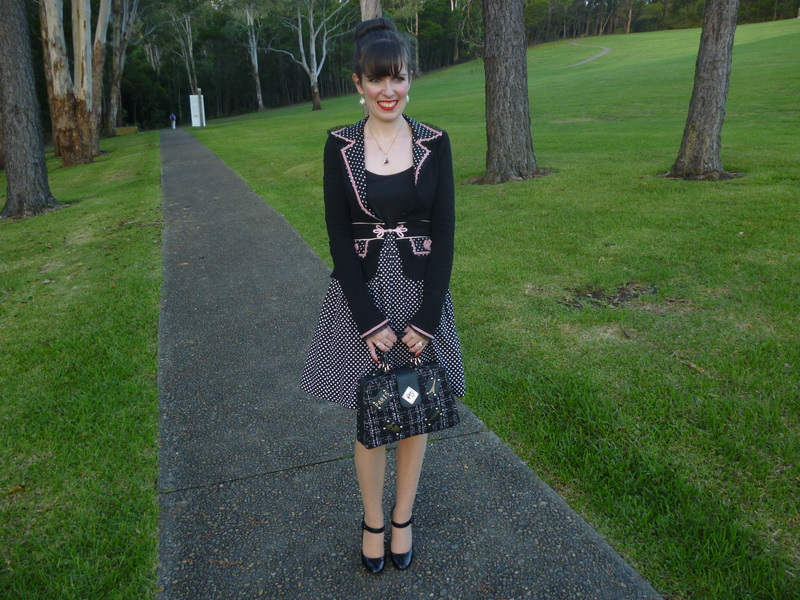 I love the memories that are attached to clothes; the skirt and jacket remind me of a happy time in my life. My mother in law bought me the jacket when we were on holidays a number of years ago in Queensland. I loved discovering the little boutique Kitten D’Amour with so many girly treasures featuring bows, pearls and polka dots. I heard there’s a store opening in Sydney soon which would be amazing. The skirt here seems to be a perfect match. When I say it is self made, my mum helped me and probably did majority of the work. I definitely wish I was better at sewing. Just need to find the time. I love this little bag I bought around this time last year. Tweed is one of my favourites too and I often wish there was more of it around. It’s like a sweet little parisien suit case especially since it’s called the ‘From Paris with Love Bag.’ That reminds me. I’ve been really interested in looking up various locations in other countries on google maps at the moment. I’ve never left Australia so I like to see the rest of the world from my computer. It’s a very interesting use of time. Other cities look so different from Australia; they seem to have so much character. Very beautiful. My friend from work says that so many of the European cities would provide would provide the perfect backdrop for outfits. One day…if I can get past my fear of planes that dream can happen. 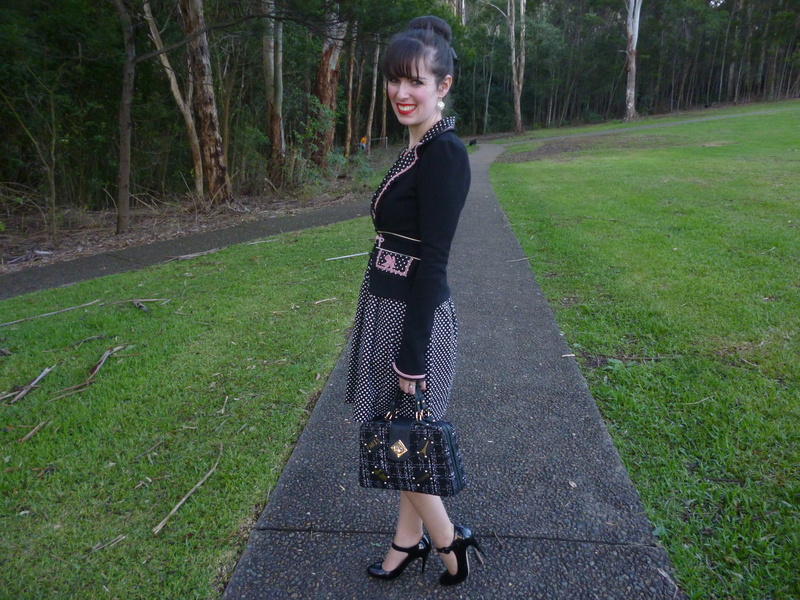 This entry was posted in Kitten D'Amour, Outfits, Sportsgirl, Uncategorized. Bookmark the permalink. I'm in love with this look. That diy skirt is marvelous and I love that cute jacket too. I hope that my fear and yours of planes will disappear one day. I'm sure you'd love Europe! You look just gorgeous! Straight from the fifties. Tia-Cherie, I love Kitten D'Amour!! I was amazed to read on the label of a top I bought from them that it was a limited run of 80, and the piece only cost $59! I bought something from them years ago when they were a market stall. Now, about flying, I think you and hubs or BFF must travel. I have been here there and everywhere without anything ever going on. Best airline for me is Cathay Pacific. You probably know, but QANTAS do a little course to help the many lovelies like you who are worried about flying. Paris and you are made for each other!!! You should fly to London, stay for four days and then do 10 days in Paris, travelling via the Eurostar train!!! Go for it!! Be sure to rent a little one bedroom apartment, somewhere in the Marais is good, if you like a bit of brassiere and night bar outings. Plus you can walk to Printemps and Galeries…great shops…and rue Cambon is a healthy walk too! Am I tempting you??? Wonderful outfit as usual! perfect shoes and bag! I love how everything matches (and I do adore polka dots)! I have no fear of flying (I used to be a flight attendant) but I understand you because I hate driving and I have a fear of driving (and other drivers). We're all afraid of something…I do hope you overcome that fear because travelling is so much fun. When my financial situation improves, I plan to travel all the time! This is so cute, I love the details I can't believe you guys made this. I am soooo bad at sewing…just not my cup of tea. This outfit is perfection on you, Imogen – so professional yet fun. I LOVE the polka dots!! Would you mind following each other on bloglovin? Thanks for dropping by:). You are the queen of well dresses and classic woman. Great outfit, love the attention to every detail, you look so chic! A beautiful outfit on such a pretty girl!! I never would have known that jacket and skirt were not a matching set! They look lovely together! Your mother is so talented! I wish I could sew better, too! This is a beautiful outfit that looks so lovely on you! It has an enchanting quality that reminds me of past days and I mean this in the best way. Very innocent and sweet. Love your shoes and the pink accents. Your outfit is so adorable! I really love the retro-style polka dots on you. I didnt know that you never left Australia. Do you have any concrete plans to travel to some places in the future? I didn't know you had fear of planes! That is definitely a really big pity, because there are so many places in the world you should definitely visit, Europe included! You always look so cute, Imogen! I love your dress and your bag is super cute.